COOL-FIT 4.0 is a pre-insulated piping system for secondary cooling with brine, glycol, ethanol and chilled water. It is suitable for temperature ranges from -50 to 60°C. Typical applications include process pipework for fruit and vegetable processors, slaughterhouses, breweries and supermarkets. COOL-FIT 4.0 will enable processes to achieve maximum efficiency without disruption, whilst also reducing maintenance and operating costs. 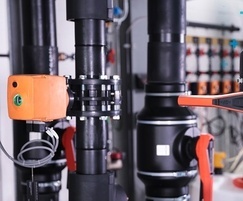 COOL-FIT 4.0 is fast and simple to install, using electrofusion to permanently connect pipes, fittings and valves in just a few minutes. All surfaces are sealed, weatherproof and UV-resistant, so the system is also suitable for outdoor installations. 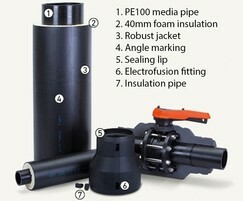 The media pipe, insulation and jacket are made of plastic and are corrosion-resistant and maintenance-free. The smooth interior surface of the pipe prevents deposits, which results in no pressure loss. COOL-FIT is significantly lighter than traditional metal systems, thereby placing lower weight-bearing demands on buildings and supporting structures. The pipes are pre-insulated prior to delivery, which reduces installation times. The low thermal conductivity of COOL-FIT's plastic pipes and the high thermal efficiency of its foam insulation means an increased energy efficiency in any system where it is used.